Headfitted is a development house where we provide sustainable IT consulting and innovative IT solutions. We are specialized in user-oriented software and have extensive experience in developing IT solutions as well as programming, concept development, user experience design (UX) and user interface design (UI). Our multidisciplinary team is ready to provide you and your organization with sustainable IT consulting wherever you are in your digitization process. Starting from your business area and organization, we focus on how IT systems and tools can make your organization more efficient and what opportunities you have for changing services and workflows. You can read more about our services here. Headfitted was founded in 2007, with office in Hadsten. Our mission is to create sustainable changes through innovative software solutions. Therefore, we engage in projects, and develop own software products that have a social perspective - and which help to improve the everyday lives. Whether for work or in the private sphere. We embrace human centered design; ...in believing that most problems are solvable, and the people who face those problems every day, are the ones who hold the key to their answer. We take social responsibility; ....through action. We think that all individuals and organizations have an obligation to act for the benefit of society at large, and for us this includes involving ourselves in the education of students, in activating people that for different reasons have been excluded from the workforce, and in involving our organization in developing concepts and project that have a social aspect and outlook. We care; ....by creating solutions that work in the present as well as in the future. We care for our employee’s well-being, and try to create a fun and meaningful work environment. We care for our customers, and trust that our experience, process and competence can help unlock real impact for them, as well as their customers. We mean business; .... by engaging in entrepreneurial ideas and individuals, and taking all projects seriously however small or large. The real value of innovation lies in defining the core values for each project, and then aiming to support the people and the organizations to achieve their full potential. We develop software that is hands-on and hearts-in. Software that is always tailored to the wishes of the customer and the needs of the product’s users. Thus, our IT solutions always work optimally for our customers. This is ensured through SCRUM, which is the basic method we develop software from. What is SCRUM in Headfitted? SCRUM is an iterative development and project management model that helps to ensure good communication and close collaboration between customers, developers and end users from start to finish in an IT project. The SCRUM process divides the development of a product into simple and easily manageable development phases of two to four weeks. These "sprints" ensure ongoing deliveries of working, concrete models that serve as dissemination tools, and provide the basis for ongoing priorities and decisions. The models contribute to a fruitful development environment, where the IT product's functionality and interaction are tested gradually in accordance with the knowledge, needs and wishes of all stakeholders. We hereby use an approach to design and development, which we call user-driven. This refers to the process where all stakeholders' perspectives (end users, assignments, peripheral users, etc.) are continuously involved, and where continuous perspectives are based on the overall usage context. "User-friendliness test" is thus an integral part of the product development itself. In Headfitted', our IT products are developed through an iterative process that is closely linked to the SCRUM methodology. Here we also work with many smaller iterations to ensure optimal consistency between what is being developed, the needs of the users / customer, and the structure and capabilities of the technical systems. 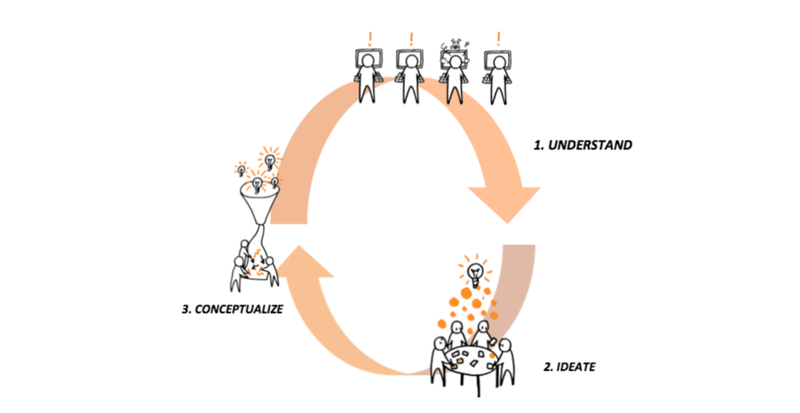 Each idea sprint contains 3 phases; understanding, idea development and conceptualization. 1. In the first phase, relevant data about the product area will be collected, such as user and contexts, competing system solutions, technology, design, or other. 2. In phase 2, the collected data is processed and structured, sorted, selected and generated new ideas and concepts. The overall result of the SCRUM process is a complete solution that builds bridges between the new and innovative ideas and established work practices. The iterative process focused on continuously developing tangible and visual deliveries, supports close communication between supplier, customer and user. The process ensures that we end up with a very user-friendly system that is geared to practice and best matches the customer's needs. 2.2. When we process personal information, we comply with the EU Data Protection Regulation (GDPR) as well as the Danish Personal Data Regulations, which may apply after May 25, 2018. 2.4. If you want insight into your personal information, do you think that incorrect data has been registered, or do you have any other objections, please contact us. You have the opportunity to gain insight into what information is registered about you and you can object to a registration in accordance with the rules in the Personal Data Act. 3.3. You can opt out of using cookies in your browser (this is not recommended). 4.1. If you are a customer or contact us by the website, headfitted.dk, we collect the following personal information about you: Name and Email Address. If you are in contact with the solution of a task, advice or a specific project, we also record information about your position, as well as billing information such as company name, CVR number, etc. 4.2. Personal information will never be disclosed to third parties unless you expressly commit to it. 4.3. We do not collect any special categories of personal information (sensitive information) about you. 5.1. We treat only personal information to the extent necessary, when you are set up as a customer. For example, it might be necessary for us to fulfill our obligations under agreements and related services. It can also be to meet the obligations we have as a Danish company where we are covered by Danish legislation. 5.2. Personal information shall be understood as defined in the Personal Data Act. 5.3. We do not make any profiles of you and do not abuse your personal information. Furthermore, we do not disclose your personal information without your consent unless we are required to do so by law. 6.1. We may share your personal information with the suppliers and collaborators who assist us in the execution of your order or assist us with our IT operations, hosting, SMS gateway, etc. This means, for example, that you share your informations with our service providers, our technical support and our bank. 6.1.2. We share your information to the extent we are required, for example as a result of reporting to public authorities like SKAT. 7.1. As data controller, we do not share personal information with recipients outside the EU / EEA. 7.2. Our Indian subsidiary Headfitted Solutions will in special cases be involved in delivering deliveries and services to selected customers. Access to sensitive data will only be granted after your acceptance and Headfitted Solutions will be subject to an approved data processing contract as a subcontractor. 8.1. According to the Personal Data Act, your personal information must be kept safe and confidential. We store your personal information on limited access computers that are located in controlled facilities and our security measures are continuously monitored to determine whether our user information is handled properly and with due regard to your rights as a user. However, we can not guarantee 100 percent security for data transfers over the Internet. This means that there may be a (limited) risk that other unauthorized persons gain access to information when data is sent and stored electronically. You thus disclose your personal information at your sole discretion. 8.2. Personal data is deleted or anonymized continuously as the purpose they were collected for termination. 8.4. To the extent that personal information about you is processed, you have the right to disclose what personal information is attributable to you according to the Personal Data Act. If it appears that the information or data processed about you is incorrect or misleading, you are entitled to require these corrected, deleted or blocked. You can object to any information about you being treated as a matter of urgency. You may also revoke your consent at any time. You also have the opportunity to complain about the processing of information and data regarding you. Complaints are filed with the Data Inspectorate, cf. section§ 58,1of the Personal Data Act. 9.1. By signing up for Headfitted's newsletter, we must have s your e-mail address. We use this information to send you the newsletter that contains knowledge and news about software development, and our own products. We do not disclose your personal information and you can of course always unsubscribe from the newsletter or update your settings for receiving the newsletter, through the links you find at the bottom of the newsletter. 9.2. We use MailChimp as a data broker to send out our newsletters and we transfer your information to MailChimp in the United States. MailChimp is a member of the Privacy Shield scheme, which means that they at least meet the same requirements as in GDPR. Your data is stored at MailChimp until you disclose the newsletter, after which we ensure that your personal information is permanently deleted.